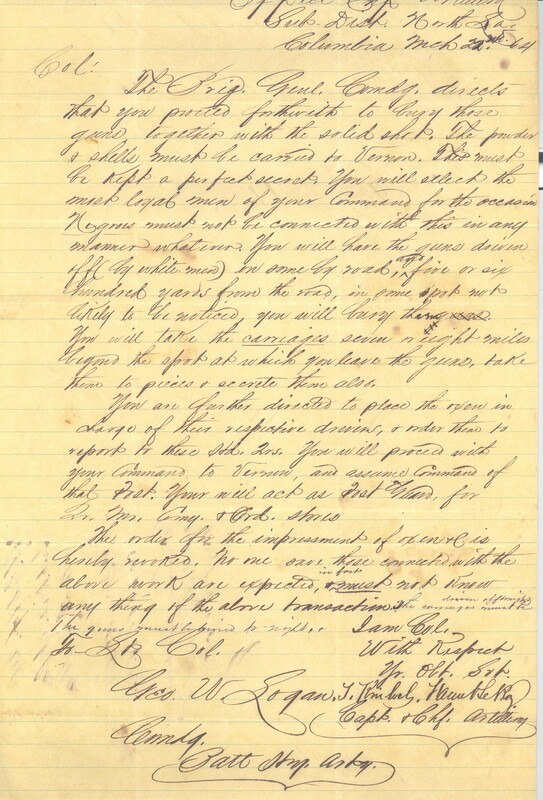 Item Description: Letter dated 22 March 1864, written by George William Logan, about burying ammunition in secret stockpiles, with a note, “Negroes must not be connected with this in any manner whatsoever.” George William Logan (1828-1896) served as a lieutenant colonel in the Confederate Army, 1862-1865. Item Citation: Letter dated 22 March 1864, found in folder 24 in the George William Logan Papers #1560, Southern Historical Collection, The Wilson Library, University of North Carolina at Chapel Hill. The Brig. Genl. Comdg. Directs that you proceed forthwith to bury those guns together with the solid shot. The powder & shells must be carried to Vernon. This must be kept a perfect secret. You will select the most loyal men of your Command for the occasion. Negroes must not be connected with this in any manner whatsoever. You will have the guns driven off (by white men) on some by road and, five or six hundred yards from the road, in some spot not entirely to be noticed, you will bury them. You will take the carriages seven or eight miles beyond the spot at which you leave the guns, take them to pieces & secrete them also. You are further directed to place the oxen in charge of their respective drivers, & order them to report to these [?] You will proceed with your Command to Vernon and assume Command of that Post. You will act as Post Guard, for [?] Ms. Comp. & Ord. stores. The order for the impressment of oxen is hereby revoked. No one save those connected with the above work are expected, in fact must not know any thing of the above transaction. The carriages driven off[?] must be the guns must be buried to night.